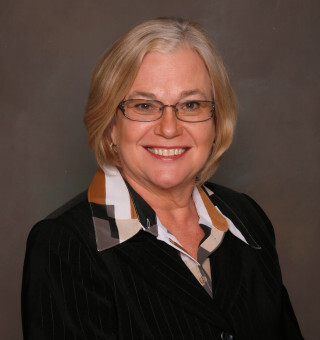 As Sarasota County Government and the county’s municipalities deal with increasing employee retirements, the Sarasota County School Board chair has encouraged her fellow elected leaders to lobby legislators for measures that would allow the Suncoast Technical College (STC) to provide the necessary training to help fill some of the positions. Shirley Brown also suggested that local governments hire students for internships that can lead to full-time jobs. Brown’s remarks came during the eighth Convocation of Governments, held Jan. 15 on the STC campus in Sarasota. 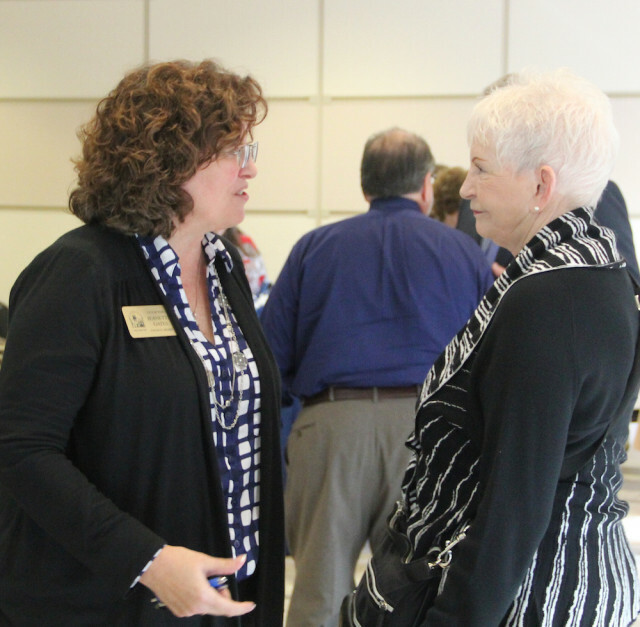 About 30 local elected leaders and top administrative personnel were among the approximately 70 people present. Concern about coping with retirements arose as Todd Bowden, STC’s executive director, provided an update on the Precision Machining Program established in 2013, thanks to collaboration between the school district and the Sarasota County Commission. Brown pointed out that during a Sarasota County Council of Governments meeting earlier that week, she recalled hearing that county government offices have about 50 openings. Venice City Councilman Bob Daniels said he believed most of the municipalities are dealing with a shortage of building and fire inspectors. “We’ve recently had two fire inspector positions open,” he noted, and the city was unable to hire a county resident for either of them. He added that he understood a person does not have to have a college degree to become a building or fire inspector; instead, the state requires people to pass a test to earn accreditation in each field. Daniels also noted that salaries of fire and building inspectors range between $50,000 and $100,000. “We’re all hurting,” he said. “What are you doing here to help us fill a void?” he asked Bowden. “[Those are not courses] that we’re authorized to teach,” Bowden replied. Only community or state colleges can provide the full range of training, he said. STC does offer one course necessary in a building inspector’s training, he noted, but that is in cooperation with the State College of Florida. Brown pointed out that Realtors probably have a high demand for home inspectors, too, given the rise in housing sales in the past couple of years. Perhaps the county’s elected leaders should partner in an effort to make it possible for technical colleges to offer all the training for building and fire inspector positions, Daniels suggested. “I’ll be happy to carry that message and make that connection [with the State College of Florida],” Bowden replied. “You are carrying the message from Longboat Key as well,” Longboat Vice Mayor Terry Gans told Bowden. “There are some political sensitivities around what [courses] are offered by technical colleges,” Bowden responded. “If you’re willing to have that conversation, I’m willing to stand behind you,” he added. “I think it might be an easy fix,” Brown said, noting that the elected leaders also should call Gov. Rick Scott to propose the necessary legislative changes. “What we don’t want to be getting into is a bidding war [with the county over employees],” Venice Councilwoman Jeanette Gates added. Her business recently offered an internship to an STC drafting student, Gates noted, prompting Brown to point out that local government offices could do the same, leading to permanent positions in high-demand professions. High school guidance counselors work with graduating seniors, Brown explained, to help them line up internships if they plan to go to the technical college. 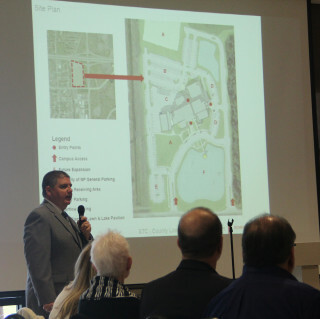 During his Jan. 15 presentation, Bowden explained that the Precision Machining Program began after “an outcry from the manufacturing community” in 2012 that too few area workers had sufficient training to fill all available positions. “If we didn’t have a partner like Sarasota County that [said], ‘This is a risk worth taking, and we’re taking it with you,’” he pointed out, the program would not have been established. The County Commission provided a $330,000 grant to the school district to make the launch of the program possible after learning the results of a 2012 survey of manufacturers in Sarasota and Manatee counties. 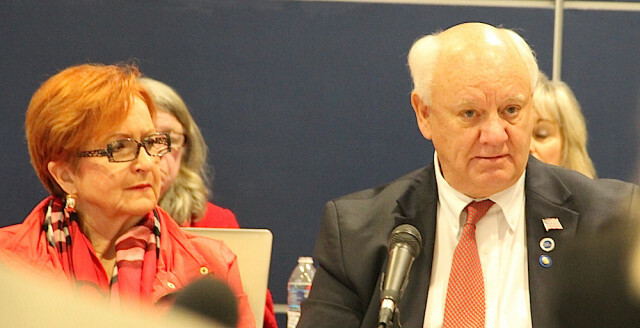 The first class, in June 2014, had 16 graduates, Bowden noted. In June 2015, nine people graduated from the daytime program and another 10 completed a series of evening classes. On Oct. 15, 2015, he said, six more students graduated; 17 are enrolled and expected to complete their training in June of this year. Furthermore, he told the group, every student who has graduated has had a job waiting. 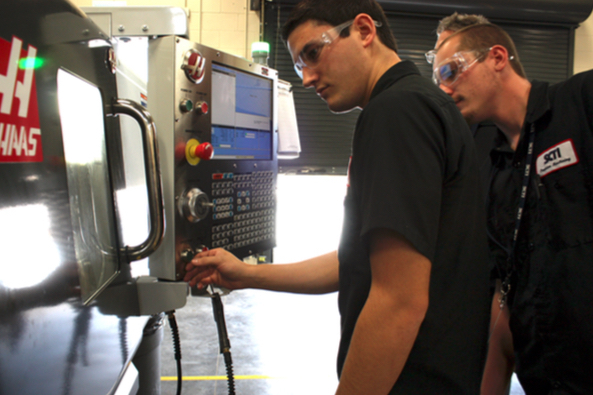 The Precision Machining Program is a member of the HAAS Technical Education Center System, he pointed out, adding that each time Economic Development Corp. of Sarasota County staff brings representatives of an industrial prospect to STC, to show them students in class, the potential new county employers say, “‘All of our questions have been answered’” as soon as they see the HAAS equipment. In fact, Bowden said, the primary representative for HAAS in the Southeastern United States lives on Longboat Key and has made it clear to the STC staff that he always is available to provide assistance. In response to a question from Sarasota City Commissioner Susan Chapman, Bowden said that the only qualification for the program is passing the Test of Adult Basic Education. “We literally have to orient [some students] to hand tools,” he added. Replying to a question from Sarasota City Commissioner Shelli Freeland Eddie, Bowden explained that STC does not have “huge demand from the student side” for courses related to construction work. Demand in that field is so high right now, he noted, that firms are taking “anyone they can get” and providing the training.